Hope Gardens kicked off another school year of giving and growing with a potluck this past Sunday. Before I say more, let me just make your taste buds a little jealous. The afternoon started out in the much-appreciated shade next to the pond (part of the 14-acre green space Hope Gardens is part of). 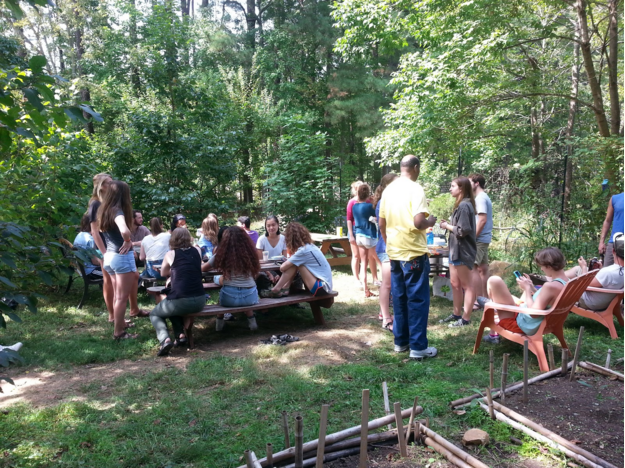 Students, members of the IFC men’s shelter, and other Chapel Hill community members gathered around picnic tables, taking in the tranquility and enjoying good company (and food, of course). A member of the IFC men’s shelter gave me a music history lesson, sharing his extensive knowledge of bands from the 60’s and 70’s. He played some Genesis songs and sang along, his singing skills equally impressive as his music knowledge. They don’t have enough sun where they live for a garden, so they jumped right on the opportunity to be a part of a community garden. Back in January of 2009, as the idea for the garden was developing, there was a meeting to invite community members to occupy sections of the garden. It was snowing, but they came anyways. The meeting was cancelled, but they were dedicated to getting a plot and soon became some of the first community members to get involved. It’s clear, too. Their plots are beautiful and flourishing. Back at the picnic tables, we all relaxed in the perfect weather (I mean perfect, it doesn’t get better), finishing off the apple crisp and sipping lemonade. Most of the group took a stroll on the nature trail surrounding the pond. We stopped to admire the lilly pads and made plans to build a wooden canoe for the pond. We finally had to head our separate ways, whether that meant a home nearby, a college dorm, or a community house down the road. Everyone seemed to have a great time (and I can say at least for myself that it beat spending the afternoon with freezing toes in an overly air conditioned library). If that sounded like a way you want to spend your Sunday afternoon, then keep your eyes peeled for updates on the next monthly potluck! And if you can’t wait that long and want to get your hands a little dirty, you can join us for workdays (Saturdays from 10am to 12pm).